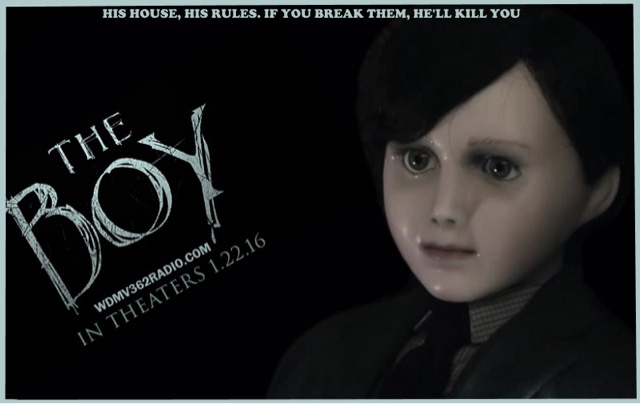 The Boy or in production being named the inhabitant from William Brent Bell the excellent director of Wer,then previous the very average The Devil Inside,we have this movie,another scary doll movie,we have had Chucky,Annabell and my other review the British film Robert,all about scary sinister dolls wishing harm on us. Staring the very lovely and Gorgeous Lauren Cohan from Walking Dead,and blink and you miss it cameo as Bruce Wayne's Mum Martha in Batman VS Superman Dawn Of Justice. Now Greta (Cohan) is escaping from an abusive relationship in the States, moving to England to have a job as an elderly couples Nanny to their 8 year old son Brahms. To Greta's amazement Brahms is actually a life size porcelain doll,as their other son died in a house fire 25 years earlier.Greta has strict instructions to follow everyone of Brahms rules,as he likes a routine,doesn't like rule breaking or even change. With Brahms parents going on holiday to Cornwall,Greta soon realises this is easy money, and completely neglects the doll to talk to her sister in America,and to flirt with the local delivery man Malcolm (Rupert Evans). The thing is Brahms doesn't like rule breaking and starts to mess with Greta's mind by apparently moving room to room by itself,even locking her in a room,but still decent enough to feed her sandwiches under the door. This is where Greta realises that the doll is possesed by the dead sprit of the dead child,and she does obey him. Things turn nasty though when her abusive American boyfriend finds where she is and trys to forcefully bring her back with him, the problem is Brahms doesn't like him very much and gives him hand written letters in blood to leave Greta alone. Now at this stage we have a major plot twist,and to say anymore would actually spoil the final third of this movie,but I kinda guessed it was coming,and if you have seen Housebound you will know what I mean. The film is still an unnerving film though,and In places very creepy. It is exceptionally acted from Lauren Cohan and all involved in this film. In fairness it is the best of all the creepy doll movies I have seen in the last few years,it was a shame that the twist in my opinion anyway, spoilt which was a very good film up untill that point,with Housebound we had a twist that actually improved the movie,this was the opposite I'm afraid,still that is just my own opinion. It is still a well acted,well directed with decent chiller moments,and sense of the Unknown about it,that in parts does get under your skin,can I recommend it? Well yes I can,I have seen better films,but the amount of truly dreadful films I have seen since doing this blog,it is a watchable movie.